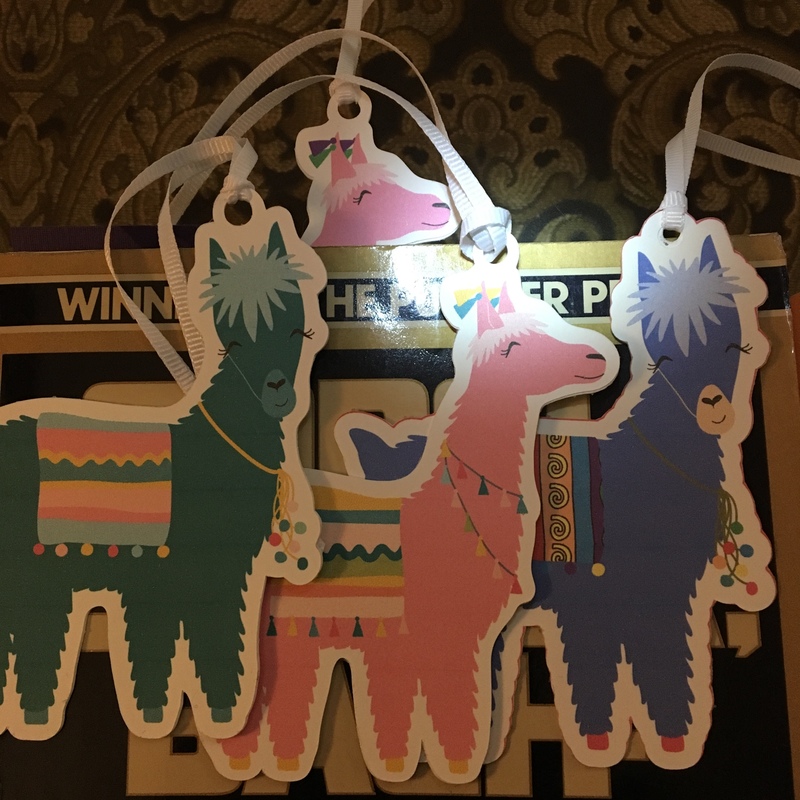 I’ve now got 4 of the most charming bookmarks ever! Alpacas!! Thank you, SuziQ! Alice, one of my twins, dances off into my Gödel, Escher, Bach: An Eternal Golden Braid, by Douglas R. Hofstadter. Alison, my other twin, grazes for but a moment in Petrarch’s Songbook a verse translation by James Wyatt Cook. She gets easily distracted and can be found prancing most anywhere. Albert, the eldest, plays in Auto-Da-Fé, by Elias Canetti, translated by C.V. Wedgwood. Alan, the baby of the herd, finds her fun in Democracy: Stories from the Long Road to Freedom, by Condoleezza Rice. 1563I have finished reading Undine, a notable fairy tale by Friedrich de la Motte Fouqué, my own copy being one included within Famous Stories Every Child Should Know, edited by Hamilton Wright Mabie. Undine comes “recommended” by Little Women‘s Jo, it being one she wished to get for Christmas, and it adds a certain charm to think of reading it to her. Thanks, Jo. In my current reading of A Walk through the Dark, I’m up to chapter 20, about halfway through. Eva Piper has just been describing how keeping a personal journal helped her through some of the most difficult times of her caregiving for her husband Don. Me, I’m now rather partial to WordPress, although I too have fill many a handwritten journal through the years. But yes, I quite agree: journaling is a powerful friend. Thanks, Eva. “Sestina” by James Cummins, in The Best American Poetry 1995 — and what would Gary Snyder pen? “Sestina for Jaime” by Katherine Alice Power, in The Best American Poetry 1996 — years and years. Meanwhile, I’m continuing to make progress through Finnegans Wake and Tarantula. Thanks, James. And thanks, Bob. Undoubtedly gender does play an important part in the making of any art, but art is art and to separate writings, paintings, musical compositions, etc., into two sexes is to emphasize values in them that are not art. Thank you so much, Suzi!! Courtesy of our fave house craftsmen, the inner wall of Suzi’s sewing room now has a handsome new workdesk area for one of her machines, aside of which she had them build a new bookshelf stretching from floor nearly to ceiling, set up for us today. Which she has reserved for me to shelve my books! This bookshelf might actually be able to hold all of my existing collection, yes. But maybe we can let it just mop up my extras, recent purchases that hadn’t yet found a good shelf, leaving intact most of my books that had already found themselves a home, then use these new spaces for a new book-buying program? Hmmmmmm? SRBS6 — Active Porch. On the left side are currently borrowed library books (except for “Century,” a book of photographs from the 20th century, which is my own). On the right side are recent copies of the tax code and pension regulations (topped by my hardcover Turco). All the items on this top shelf will be quite active, rather likely to be off the shelf any time I am doing my reading in Suzi’s sewing room. SRBS5 — Pensions and Mathematics. I’d already begun the final emigration of my pension book collection from the Cube. With the space given by this bookshelf, I’ll now give the rest of that collection their tickets to come home. Round that out with the few math books I’ve kept (or recently bought), and this second highest shelf will soon enjoy full occupancy. SRBS4 — Poetry. Given the height and depth of these shelves as contrasted with my other shelf spaces, I’ll be keeping my smaller-covered poetry books on my Closet Bookshelf. And at least for now, I’ll be keeping my Living Room Poetry Shelf intact. 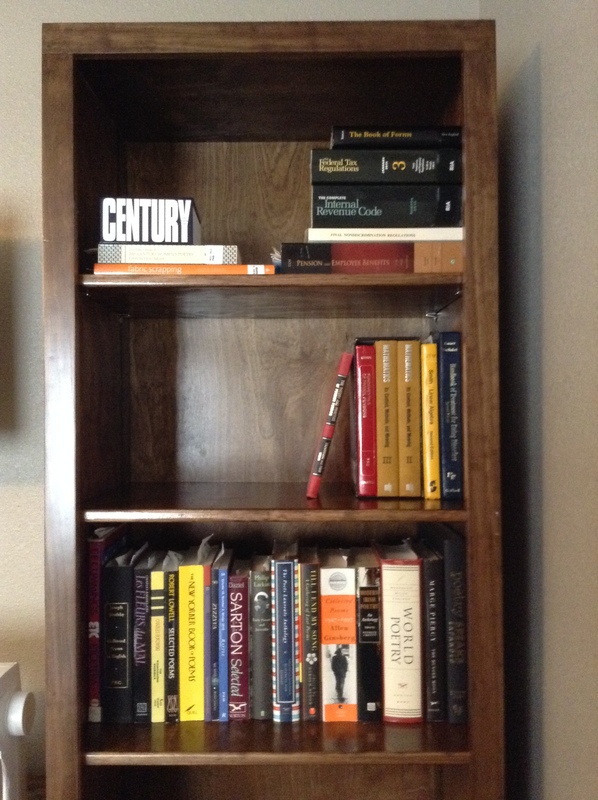 So for this upper-middle shelf on the new bookshelf, I’ll start with some of my larger-faced poetry books. Not as yet in any order, and possibly to be replaced by other of my poetry books as I reshuffle things over the next several days as I settle into these new quarters. Again, thank you so much, Suzi! Ah, nice, quite nice! I’m on a self-imposed routine to re-read one of Dylan Thomas’ poems per day through the rest of this summer and into the autumn, anticipating completing that re-reading course on October 27 of this year, the 100th anniversary of the birth of the poet. 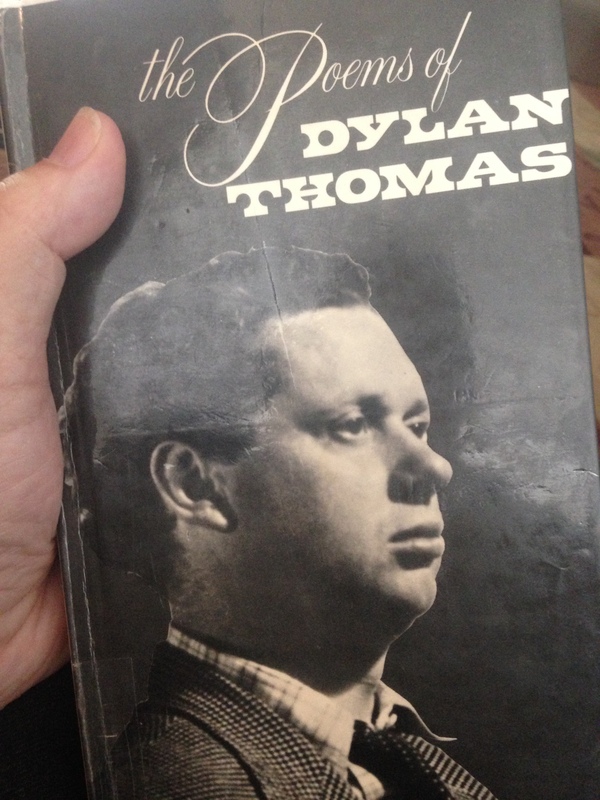 To set my re-reading schedule, I’d relied on my own personal collection’s copy of Collected Poems of Dylan Thomas 1934-1952 (1971 New Directions paperback), together with a few other DT poems picked up elsewhere along the way. But then a few weeks before I was set to launch my DT re-reading, I lost track of where I’d left my book. Turns out I’d moved it from my bookshelves to my transit bag seeing most current Starbucks action . . . then hadn’t been to Starbucks for several weeks due to other activities. But by the time I relocated my own book (thanks, Suzi), I’d requested backup from my local library, which had to order theirs from another library branch somewhere else in the county. Theirs came in sometime the past several days, but I waited to pick it up until I was ready to return the Stevie Smith poetry book I had out on an extended loan. Because I’d since found my own Dylan Thomas volume, I came close to just leaving theirs, which after a 9-day holding period would have been shipped back to its own library branch like an illegal immigrant. Ah, but it wouldn’t hurt to keep the library’s copy on my nightstand and send my own copy back to my Starbucks travel kit, right? Anyway, since I’m already a week into my re-reading schedule, I’ll be doubling up on a few days, first re-reading the poem I’d originally scheduled for a particular day, then adding a first-time reading of a DT poem I’ll not have seen before, how many newbies on how many two-poem days yet to be determined over the course of the coming weeks as I explore this library book. Sometimes you have to lose something you know you still have in order to find something you didn’t know you were missing.